For my birthday back in August, hubby bought me what I consider to be the coolest book I own: William Blake's The Complete Illuminated Books. This very large and beautiful volume has been put together by Thames & Hudson via The William Blake Trust. It reproduces in all their lurid details and colours, Blake's hand-printed books, and in their original sizes; thus, the 1794 version of There is No Natural Religion is exceedingly tiny (each plate is about 2.25 x 2.5 inches), whereas the later, more fully developed, prophecies like Europe and Jerusalem fill the pages at about 7 x 9 inches. I am very, very slowly making my way through this tome. As of tonight, I have read (repeatedly) All Religions Are One, There is No Natural Religion, and the Songs of Innocence half of Songs of Innocence and of Experience. 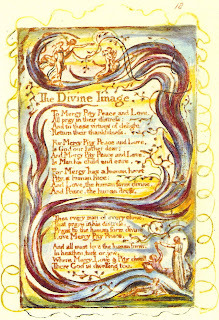 "God becomes as we are, that we may be as he is"
There is No Natural Religion is one of Blake's first attempts at marrying textual and visual art. 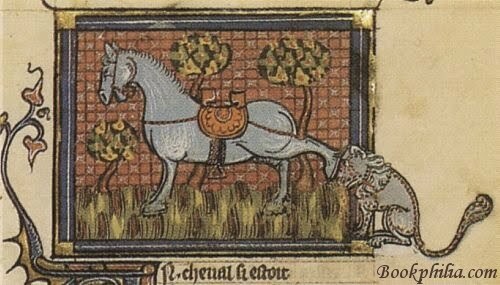 The artwork in his first two books is rather drab compared to what comes later, beginning with Songs of Innocence and of Experience; however, his mystical leanings were alive and well all along, it seems. "God becomes as we are, that we may be as he is" is Blake's, to me, startling conclusion to the concise and extremely deceptively simple "Principles" which lead up to it in There is No Natural Religion. I could not wrap my head around how he got to this profound and world-exploding conclusion - I know how to deal with the principles of logic (or something like it), not the principles of mystical prophecy. While reading these early books of Blake's I had a feeling I'd been there before, and indeed I had, in a way. Reading the Tao Te Ching years ago I would find myself approaching some kind of understanding of Lao Tzu's thoughts but the moment I realized I almost understood, that comprehension would slip away. The same has been happening with Blake and I fancy I can hear him and Lao Tzu laughing, not unkindly, at my mental stumbling. 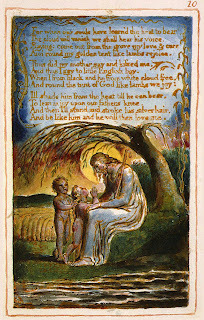 "And I wrote my happy songs / Every child may joy to hear"
In his "Introduction" to Songs of Innocence, Blake and/or his narrator describes how the pastoral poems in this book were demanded of him by a cherub listening to him sing. As the editor notes, these poems, while often understood to be for children, are really about (spiritual) childhood and its relationship to Christ. I've taught a number of the poems in this collection, along with their counterparts from Experience, which I haven't read in its entirety yet; but plucking these poems from the illuminated context in which Blake imagined them, and divorced from the larger book is, I realize now, to do them the greatest of disservices. 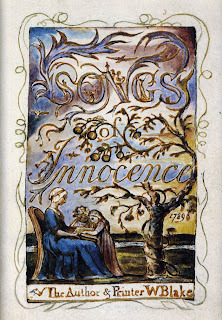 Reading Songs of Innocence as it was fully imagined by Blake has been a rather exhausting experience, and not just because I am not accustomed to considering visual artistic meaning, much less when it's fused with textual meaning. A lovely sentiment. And yet, the dark side of God's descent into the human, which I believe will lie at the heart of Songs of Experience, seems already to be present here and in other poems which embody this idea(l). The final stanza, as much as it seems to embrace a sort of divine acceptance, in fact reiterates difference and alienation by the enumeration of those not generally inclined towards Christ. The whole point of the divine image is that it contains everything, and there are no distinctions; and yet, Blake insists upon the distinctions at the end. "But oh my soul is white!" And I am black, but oh my soul is white! And round my golden tent like lambs rejoice',"
Given England's involvement in the slave trade when this poem was penned, it would be all too easy to assume that Blake was just racist, his attitudes reflective of his time. But as I'm no fan of the biographical criticism, it makes more sense to me to consider how this poem and "The Divine Image" function in relation to the ideas of innocence on the one hand, and what it means for God to become more human so that humans might become more divine on the other. Innocence is generally, in this book, shown to be just as benign and beautiful as you'd imagine it to be. Yet, it also allows for an unthinking acceptance of the status quo, whether that be in relation to racial difference or, in the case of "The Chimney Sweeper" (of which there's a different version in the Experience section), abusive child labour practices. Even as Blake sets up the terms of Innocence as the way in which the childlike may draw closer to the divine, he begins to hint at the ways in which God's descent towards us cannot help but sully the divine. 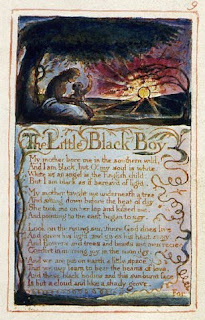 Where Blake's emphasis on racial difference falls - in the acknowledgment of humanity's fallen nature (in particular late 18th-century English humanity's fallen nature) or an unwitting example of it - I don't know. I do know that in spite of the critical response I can't help having to such moments, I am still and always entirely enraptured by his use of language; and the yearning for a divine presence I don't particularly feel a need for becomes personally and immediately recognizable to me when I read his work. Blake's amazing conclusion to There is No Natural Religion, in other words, is not simply an unmitigated kindness on the part of God; it is also necessarily an acknowledgement of how humanity will drag its own ideal down into the muck. But I'm basing this in part on what I recall of the segments of Songs of Experience that I've read in the past, and so I remain open to revising this theory altogether. Also, I acknowledge that I tend to present the obvious as though it's a gift of the Magi and for this, I beg and rely upon your compassion for my intellectual floundering. Such beautiful little books. For those unfortunate enough to not own the Complete volume (for example, me), the little Dover editions are fine, inexpensive substitutes. I had the same experience - moving from anthologized Blake to these images is shocking. I don't know what to make of it, but the chimney sweep is also a black boy, an English one. I have the norton edition of William Blake and it has a good number of the plates as well. This sounds like it's beautiful. I'm looking forward to revisiting Blake soon! Blake is so wild, I love his illustrations. What a marvelous birthday gift to have received! Amateur Reader: You're right, he is. I'll keep this in mind when I move on to Songs of Experience. Rebecca: Blake rocks! Especially when he doesn't feature in bad Hannibal films starring Ralph Fiennes as a serial killer wearing his grandma's false teeth. Stefanie: Yep, my hubby is the best hubby ever, especially on birthdays!